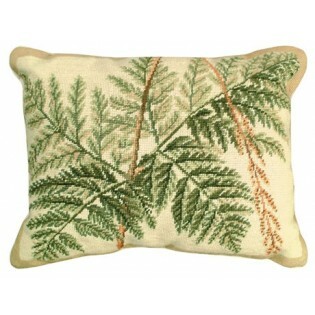 This maiden hair fern pillow is hand made needlepoint pillow with a beige velvet back. Zippered cover for ease of cleaning,,100% wool face. Dry clean only. The Maid Hair Fern Pillow is a beautiful handmade needlepoint pillow. The face of this Needlepoint pillow is 100% wool and is made up of roughly 100 stitches per square inch. 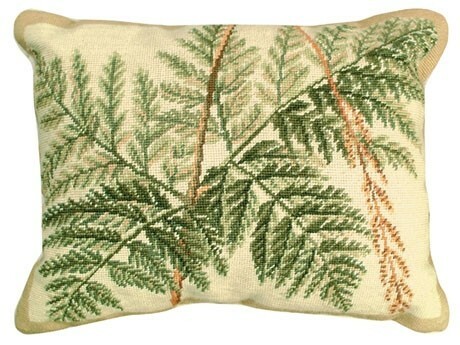 Lovely shades of Green make up the Fern design gracing the front of this pillow. The Fern leaves lie upon a beige field.